Gritty, determined and ultimately victorious, but no-one summed up the character shown by Hibs as they clocked up a first win at Tynecastle in six years than captain David Gray. Left sprawled on the turf in the goalmouth below nearly 3400 of his side’s fans as the teams headed for their respective changing rooms and the chance to draw breath after a frenetic opening 45 minutes, it didn’t look good. There was obvious concern as the Easter Road outfit’s medical team gathered around him, a prolonged period of treatment ensuing before, groggily, he was helped to his feet and up the tunnel. It would have surprised few if he failed to return after the interval but, there he was, obviously still suffering from the blow he’d suffered in those seconds before the half-time whistle as Hibs fought to ensure they’d resume on level terms, Daryl Horgan having cancelled out Peter Haring’s earlier opener for Hearts. 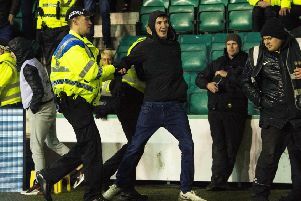 Eventually, even captain courageous was forced to quit having more than once been counselled on the touchline by Hibs head of sports medicine Nathan Ring. But, as Jonathan Spector took his place, Gray departed knowing that his team-mates were on the verge of a win which would lift Paul Heckingbottom’s players above the Jambos and keep them very much in the hunt for an unlikely place in Europe, Horgan having claimed his second goal of the game. Gray’s determination, insisted fellow defender Paul Hanlon, simply epitomised the fighting spirit which has seen Heckingbottom’s side take 20 points out of a possible 24. He said: “I didn’t notice he (Gray) wasn’t feeling too great although he told me at the end of the game he’d been sick. “He was feeling a bit groggy as he took a knock on the side of his neck at the end of the first half. He was a bit shaky at half-time and again at the start of the second half. “The fact he didn’t want to come off just sums up his character. There was no way he was going to come off easily. “But, when you have a sore head then you got a load of headers coming your way as happened to him, that knocked him even more. 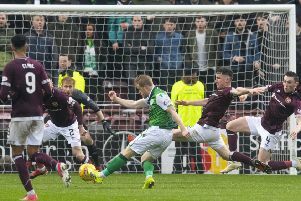 Calm is rarely a word used in the context of an Edinburgh derby, Hibs under the cosh as they found themselves with their backs to the wall, a seemingly inevitable goal for Hearts coming via the head of Haring. None more than Horgan, the winger instigating the most decisive move of the game as he fed Kamberi, his first time pass to Stevie Mallan as quickly moved on for the Republic of Ireland internationalist to curl a superb shot round Hearts defender Michael Smith and into the bottom corner of Zdenek Zlamal’s net. As expected, Hearts sought to use their physical advantage to get back on level terms, the obvious threat being the towering figure of Uche Ikpeazu, the Jambos hitman left a forlorn figure as he found Hanlon and McGregor an unmovable barrier. And that, insisted Hanlon, was simply down to brain over brawn. He said: “You can see exactly what he is. He is big, strong and powerful. He wants to use his body as much as he can but I thought myself and Darren worked well against him. Hanlon admitted he’d looked on Ikpeazu as a major threat, saying: “If you look at Hearts’ good results then he usually plays well. “We knew he would be a threat. I could go in the gym all I want but I will never be his size. I think he must be twenty kilos heavier than me so you can’t get into situations where he can out muscle you. As Hearts pounded forward, overloading their frontline with the introduction of Aidan Keena and then Steven MacLean, Hibs were quick to hit on the counter, Mallan forcing a flying save from Zlamal, who then did even better to prevent McNulty adding to Horgan’s brace. It may have been a while, but Hanlon and his team-mates showed they hadn’t forgotten how to celebrate at the home of their most bitter rivals, lingering long after the final whistle to take the adulation of those fans who’d crossed the city. He said: “I remember the 2013 game and it has been a while. The fans turn up here every time in full voice so it is nice to send them home happy. It is no more than what they deserve.